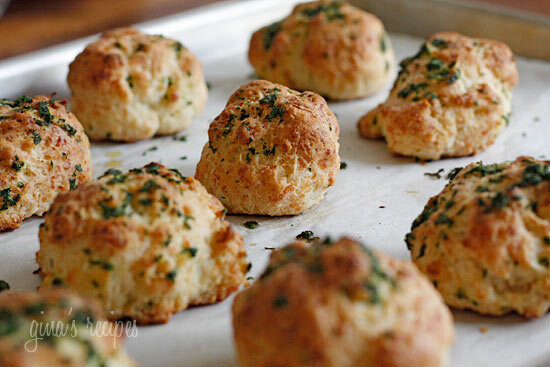 Super easy golden cheddar biscuits drizzled with garlic parsley butter. Make sure you have some company to enjoy these with, or you’ll be tempted to eat them all! 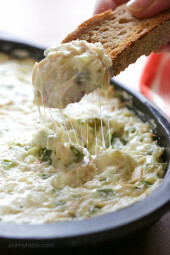 This is the perfect side for any soups, holiday parties or even brunch! Some great company mains might be Tomato Bisque, Slow Cooker Turkey Breast with Gravy, or Spinach Feta and Artichoke Breakfast Bake. You can easily halve this recipe. Of course, they taste best fresh out of the oven, but reheating them the next day is still good if you have leftovers. Melt butter in a small frying pan, add half the garlic and saute on low heat about 1 minute. In a large bowl, combine biscuit mix, cheddar cheese, and remaining garlic. Stir in milk and mix (do not over mix). Drop batter by heaping tablespoonfuls (1.5 oz each) onto prepared cookie sheet. Brush or drizzle biscuits with melted butter. Bake for 5 more minutes, or until lightly browned on the bottom. Love these biscuits! So much better than a biscuit recipe on the box. I may even add a little more garlic to the dough next time. I’d also like to figure out how to make a bigger version and serve under a fried egg…something for breakfast. Can this be made without fresh parsely and sub in parmesan cheese for cheddar? If so, what amounts would you suggest? My husband and son said these were the best biscuits I ever made!! That’s all thanks to your wonderful recipe!! These turned out awesome. My husband doesn’t even like biscuits and he couldn’t stop eating them. Think I could make a full batch but freeze some for future baking? TIA 🙂 Love your recipes! I wonder how these would taste with gluten free bisquick? I made these tonight and they were SO good, and super easy!! Thank you Gina for making WW easy to stick with! I LOVE your cookbook, too!! I made these tonight for dinner and they were a hit! My family thought they tasted just as good as the biscuits at Ruby Tuesday. Thanks for sharing!! Trying this tonight! Can't wait! Thank you! i tried to read all the comments but may have missed one…. Can I use Gluten Free Bisquick??? I love all your recipes! This website has been awesome for me and my husband! He is super picky but has like everyone of your recipe's I have made and it's healthy for him too! Thank you so much for contributing such a wonderful blog that has healthy, yet tasty recipes! You are great! Seriously the only legit problem with these biscuits is that I cant stop eating them! I tried posting this earlier and I'm not sure if it worked so sorry if this is a double post. I couldn't find shredded Cabot cheese. I picked up a white block of Cabot cheese that says sharp light Vermont cheddar, calories 70 and fat 4.5g for a 1 ounce serving. Is is the correct item? I am counting points and want to make sure I am accurate. Thank you. Thank you so much for your delicious recipes! I've cooked several of them over the last few months. Today I did a cooking marathon of your soups: chicken pot pie, crockpot turkey white bean pumpkin chili, stuffed pepper and turkey chili taco. Also made these biscuits. Your recipes combine good flavor, healthy ingredients and ease of preparation. As many other people have commented, I don't feel like I'm missing anything. Thank you! Thank you so much for this recipe. I've made this 3 times already and it's always so satisfying. This version is much lighter than the Red Lobster ones and it doesn't skimp on taste and flavor. I don't have a family so I usually opt to half the ingredients and it makes about 6 biscuits. I also don't have the reduced fat version of the sharp cheddar but luckily the points worked out to be the same. I know this is an old post but I'm a new reader! Would you recommend adding some Cream of Tater to these to give them a bit of a tangy? Kind of like Red Lobster bisuits? I made these with the unsweetened Almond milk, since I haven't used regular milk in years, and a fat free cheddar cheese…2WW points!! I made these again tonight. Last time my son thought the garlic was too strong so tonight I threw the garlic butter into the batter and then brushed a bit of plain butter on instead. He loved them. They were delicious. I adjusted for the bit of extra butter in my points but I could have cut it in half and used half with the garlic in and the other half outside. I am also loving you for this recipe! I've been wanting something bready but for the gluten, it has to really be worth it for me! I can't use GF Bisquick because it has soy, which I'm allergic to! So, when I saw the reviews for these, I thought I'd have to try it!. I am also lactose intolerant, so I used unsweetened almond milk and I can't believe it's not butter, since that's all I had. I also was out of parsley, so I used a pinch of rubbed sage! My calorie count was about 74 cals! They will be gone by the end of the day, I promise. Kids and hubby all love it! Thank you for making something worth risking gluten for, I think! Oh I am so loving you for this recipe. I love the biscuits at red lobster, and could eat my weight in them. I only get them about twice a year when out of town. So now, I can make them at home, and not hate myself later….. These were great!! I used Low fat buttermilk because it's all I had in the fridge and it gave these biscuits a nice little tang. Thanks Gina! Big hit with the family. VERY easy to make, thanks! I did an online search at my local Giant Eagle for the Cabot 50% reduced fat cheese but they only have the 75% light kind- I've noticed the 50% in a lot of recipes so I was hoping to stock up, does anyone know if the 75% would make that much of a difference in most dishes? 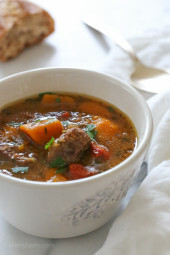 These were so easy and will be perfect with Beef and Barley soup!! Made these tonite and while it was a rush job ans they were ugly ..they were deelish ! Hubby gave them the thumbs up! No need to go back to Red Lobster since this was all we were going for .. These are seriously dangerous. My kids (2&4) ate 2 a piece, and I was tempted to eat more than one. I paired with your Baked Potato Soup which was also a huge hit! 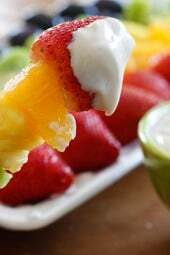 These are perfect and so easy to make! Perfectly paired with your Chicken Pot Pie Soup! Thank you!!! WW 2 Points Plus per biscuit. I ate 2 of the biscuits with a salad that had fat free red wine vinegar and lemon & pepper…oh, it was so good! do you use salted butter? thanks! Did you ever make any headway with a recipe from scratch for these? OMG I just made these with the chicken pot pie soup and all I have to say is DELISH! I didn't have fresh or dried parsley on hand so just made them without. Super easy and super yummy! I just baked these delicious, yummy, tasty biscuits, they are the best, my husband and my 18 months old boy love them, thanks a lot, you make may life and my WW plan go easier!!! Ana Miller. Do these need to be refrigerated or can I leave them out? Hi Gina, Any suggestions for an alternative to Heart Smart Bisquick ? I'm in Australia and I'm pretty sure we don't have that product here? Can I substitute with self raising flour and will it alter the points content? Help appreciated as I'm going to make the pot pie soup this weekend!! Yum! Can margarine or extra virgin olive oil be substituted for butter? Made these last night with your meatball and spaghetti soup and OMG, the whole dinner was delicious.. It was hard not to eat all of the biscuits!! Thanks so much for your recipes. Love this site! I made these tonight with stuff I had on hand…. 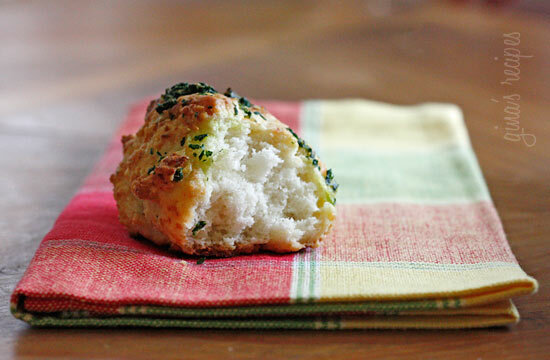 used 2 tsp dried parsley, regular bisquick, and I used almost a cup of parmesan cheese instead of cheddar. They turned out super yummy! Thank you so much for the recipe! I'm assuming you could use whole wheat flour if you wanted to, but I'm not an experienced baker, so I could be wrong! Gina, thank you so much for all the incredible recipes! My husband and I are trying to eat healthier, and everything on here is delicious, even to a super-picky man! My first time making biscuits. They're really good, but I wish I skipped the step of lining the baking sheet. I didn't have parchment paper, so I used foil because I read that it's a good replacement. The biscuits stuck to the foil. I had to scrape them off and it was a mess. I realized that I probably could have skipped the lining and used cooking spray, since I have a non-stick baking sheet. Other than that, the biscuits turned out really good. My taste testing turned into a meal, and looking forward to the leftovers. And lesson learned: biscuits stick to foil, so next time I'll skip the lining. I didnt have parchment either but I used foil I just lightly sprayed it with cooking spray they slid right off.. I just made these and added turkey sausage crumbles so they would be breakfast biscuits. These are so awesome! I freeze them on a cookie sheet, and then store them in a ziploc in my freezer. So easy to just warm up one or two at a time. My boyfriend and I are garlic-aholics so I doubled the garlic in this recipe and they were absolutely delicious. Can't wait to make them again! I just found your site through Pinterest and I am so glad I have! I was wondering if you ever had any luck making these from scratch? I am trying really hard to keep our food costs down and use less processed foods. These look delicious and I would love to try them. Thank you so much for all the great recipes! I made these last night. I thought that they were pretty bland and would not put that much parsley w/the butter, next time. This morning since, I had left over pepper jack cheese I decided to make them w/the pepper jack cheese. OMG! I think I died and went to heaven. I only put half the amount of parsley that it called for w/the butter and no garlic in the butter. Only garlic in the batter. LOVED IT! Thanks for another awesome recipe! Gina, is there a gluten free version of these biscuits?! 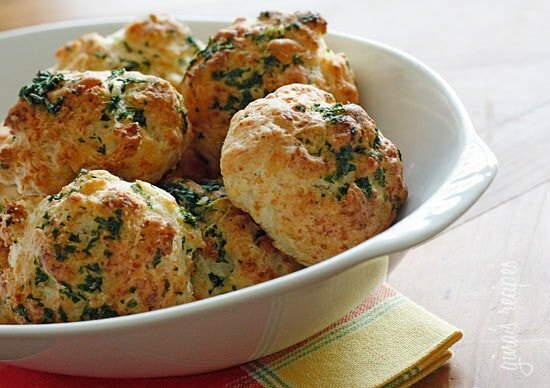 Gina-I made these last week, my husband told me that they were WAY BETTER than the "cheddar bay" biscuits from Red Lobster (which he LOVES!!) And reheated the next day, omg they taste even better. However, I felt like the butter/parsley mix had way more parsley, to where I literally had to use my finger to spread it around the biscuit. Any other suggsetions? I was looking for a low fat version of garlic bread and found these biscuits. 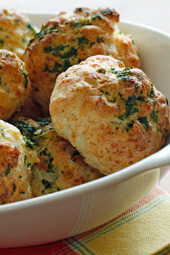 Could I make them without the cheese and just make garlic biscuits (we're having it with your crockpot bolgnese sauce and I don't know how much a cheesy biscuit would work)? Would I need to adjust anything else? I made those with spaghetti, very easy to make and moist too. Thanks!!! I only have 1% milk so I'm going to use that and LIGHT butter instead of full fat butter…I put it in the recipe builder and it evened itself out to 3 points still!! Yay!!! Question…my sister-in-law made a similar recipe on New Year's Eve…she put a shake of Old Bay seasoning in it…they were perfect! Have you ever tried that? I might add a tad to this recipe! Light, fluffy, and buttery! Thank you! I made these to take to a Christmas party. Everyone gobbled them up and no one even knew they were WW friendly! I used my trusty cookie scoop to make them all the same size. They were so easy and fast to make I know they will be something I go to again and again. I've been enjoying all your soup recipes lately and these would go along perfectly with any of them. Can I use low fat buttermilk instead of regular milk? I have the buttermilk for another recipe. Love, love, love these!! DH said they were even better than Red Lobsters! He ate almost all of them. I hope it's ok, I am featuring this recipe on my blog tomorrow! I am also sharing your Brussels Sprout recipe. Of course you get all the credit! I've made these 4 times for dinner parties (including thanksgiving!) and they have been a HUGE hit. thank you so much! My family and I LOVED these!! Thanks for another great recipe. I think these are best fresh, you could probably reheat them in the oven a few minutes but like any bread they are best the first day. I have not tried making the batter the night before, if it works let me know! Can I make the dough the night before, keep it refrigerated and then bake the next day? I'd like to make this Wednesday night and then bring them to my mom's on Thanksgiving and bake them there so they're fresh out of the oven. I want to take this to a friend's house for Christmas dinner. How do I reheat them? Oven temp? Covered in foil? Center of oven? How long? I'm a good cook but not a GREAT one so I want to make sure these are as tasty the next day as the day I prepare them. SO excited about making these!!!! Any luck with the from scratch version? Hi Gina, these look absolutely yummy. I wanted to know if you had a recipe for garlic bread, or is this the closest recipe you have? I look forward to hearing from you! I made these last night…so yummy!! I used fresh rosemary instead of parsley because that's what I had on hand. Had one for breakfast this morning with turkey bacon~my new favorite breakfast! Thanks for the recipe, Gina! I was also lazy and used the already minced garlic. The biscuits were kinda flat like pancakes. Learned my lesson, don't be lazy! Made these tonight and I didn't love them as much as I thought I would. They looked beautiful, just like the photos, but tasted a bit mild. I used regular extra sharp cheddar as my light cheese got eaten by the kids (as usual), so I would have thought they would have had a little "bite" to them. Any suggestions? I'm worried the Heart Smart is too sweet rather than having that salty/baking powder taste. I shredded the cheese using the larger shredding holes, should I have gone smaller to distribute more? These are great! I make them at least twice a month, and my husband is always super excited to find them in the oven. He loves to take the leftover ones to work with his lunch, which saves me from the temptation of having a bunch in the fridge! Can I use whole wheat flour instead of the bisquick? Very delicious. Had them with Shrimp, Roasted Corn, Tomato and Avocado salad. Great summer time meal. I will definitely be making these again. Very easy to make!